1. Spoon the parfait into a bowl and mix using a whisk. Place the bowl in the freezer for 20 minutes. Using a melon baller approximately 22mm in diameter, scoop out small balls of the parfait. Place in the freezer for 1 hour. Roll into uniform balls between the palms of your hands. Insert a toothpick into 1 side and place back in the freezer for at least 2 more hours. 2. For the tomato jelly, place the tomatoes in a blender and blitz until puréed. Pass the purée through a fine sieve. Weigh 125g of the sieved tomato juice into a bowl, add the ketchup, salt, sugar and enough red food colouring to give a bright tomato-red colour, and place in a small pan over a low-medium heat. Soak the gelatine leaves in cold water. When soft, squeeze out the excess water and add to the pan with the purée. Allow the gelatine to melt, stirring occasionally. 3. To assemble the tomatoes, allow the tomato jelly to cool to 19°C and, holding the toothpick, dip the chicken liver parfait balls into it twice. Place the toothpicks on a piece of Styrofoam or card, and keep in the fridge for a couple of minutes. Remove the toothpicks and place on a tray lined with parchment paper. Keep refrigerated until needed. Before serving, place the reserved tomato stalks on top to cover the toothpick holes. 4. Preheat the oven to 180°C, gas mark 4. Place the bacon on a tray that has been lined with parchment paper and place in the preheated oven. Cook for approximately 10-15 minutes. 5. Make a beurre noisette (nut butter) by melting the butter in a medium pan over a gentle heat, whisking continuously, until the solids turn golden brown and give off a nutty aroma. Immediately take the pan off the heat and strain the butter through a coffee filter. Then mix together the beurre noisette with the sherry vinegar, until combined. Store in the fridge. 6. For the scrambled eggs, using a fork, mix the eggs, milk, cream and butter together in a heatproof bowl. Season with salt and stir to combine. Place the bowl over a pan of simmering water and allow to cook really slowly using a spatula to continuously stir the mixture. Cook until the eggs begin to scramble – this should take around 15-20 minutes. 7. 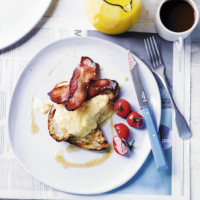 Serve the scrambled eggs with the smoked bacon, tomato meat fruit and your favourite slice of crusty bread toasted. Drizzle over the acidulated beurre noisette.